Maybelline Master Prime || I may have mentioned this primer on the blog before and after using this particular one for the 3rd time I'd say I'm still a fan. It's a great drug store primer, but unlike with a higher end primer like the Hourglass Veil Primer, it doesn't have that silky smooth light feeling. It's on the higher end for a drug store buy, but it's still the best drug store primer I've used. Would I repurchase: YES, but I would probably try another version in the same line. IT Cosmetics CC Cream || Not much to say for this product that I haven't already shouted from the rooftops. For my thoughts you can read this post from January or this one back in March. Seriously, this is my go to cc cream and provides the best coverage on it's own as well as a with a pressed powder for a more matte finish. This is a holy grail item for me! Would I repurchase: Emphatic, YES! Clinique Eyelash Primer || Do you use eye lash primer yet? If not, it's the best way to fake false lashes - I even wrote a post about it! This is one of those products that I will always use, will it always be the Clinique brand, not necessarily, but I do like to alternate which lash primers I use and this one is awesome. I'm currently using L'Oreal Voluminous Lash Primer and loving it - dare I say more than the Clinique or Origins ones I've used in the past! Would I repurchase: More than likely yes, but I will be using L'Oreal's version for the next few months! Kat Von D Lock It Concealer || I first reviewed the concealer with my first impressions last August and while my overall feelings are still the same, I did enjoy using the product. While the product itself isn't heavy, it does have the ability to be cakey if not properly applied and set with a powder. One of the things I liked most was that it took a long time to use up a tube even though I use concealer every day - for that reason if I had purchased it the ROI would have been great. Would I repurchase: Going to pass on this one even though I liked the product I think there are other's in a similar price range that I like more like the Bare Minerals one I'm currently using and my cult favorite NARS creamy concealer. Herbal Essences Shampoo || This is probably the part of the video where I was starting to loose steam and possibly not even make sense, but that's what makes it funny to watch!! I'm a huge fan of Herbal Essences products and have used them for years!! I don't know of many women who haven't at least tried one of their lines in their lives, it's a cult favorite. Loved the smell of this one and would recommend it - the price point is always nice for a drug store buy & it didn't leave my hair feeling heavy, which with long hair is really important to me. I also get a lot of questions on if I use a special shampoo or conditioner (read: expensive) and the answer is no, I use all drugstore under $5.99 shampoo and conditioners! Would I repurchase: Definitely, but will probably try another scent! L'Oreal Ever Pure Shampoo & Conditioner || This was sent to me via influentser a few months ago and I really liked both products. They came out with this "ever pure line" that includes oils and heat protectors as well. What I enjoyed most was that it was 100% paraben free - I think we're all pretty conscious of things that we put into and on our bodies. Video edit: I explain my concern for the bottle construction and possibly an odd fact about myself! Would I repurchase: Yes, it's at a great price point and I feel good about using it on my hair. Aqua Di Gioia || This perfume was a gift for my birthday last year (2016) and I absolutely fell in love with the scent. Gary uses the men's version which I also enjoy so much so I knew I'd like this one. I have a really hard time explaining the scent of this in the video, but it's pretty perfect year round. If you like to splurge on scents then I do recommend this one. I don't normally buy myself full bottles of perfumes and opt for roller balls instead - so I would definitely do that. Would I repurchase: More than likely in roller ball form. Urban Decay Perversion Mascara || The size that I show in the video is a sample, but I actually had the full size one that I got rid of before I realized I was doing an empties video. This is probably my least favorite mascara that I've tried. It's way too "wet" and that's just not my favorite consistency when it comes to a mascara. I will no doubt sneeze or have something in my eye that causes everything to just look messy! 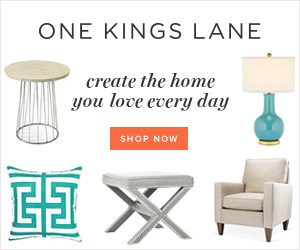 Would I repurchase: No! 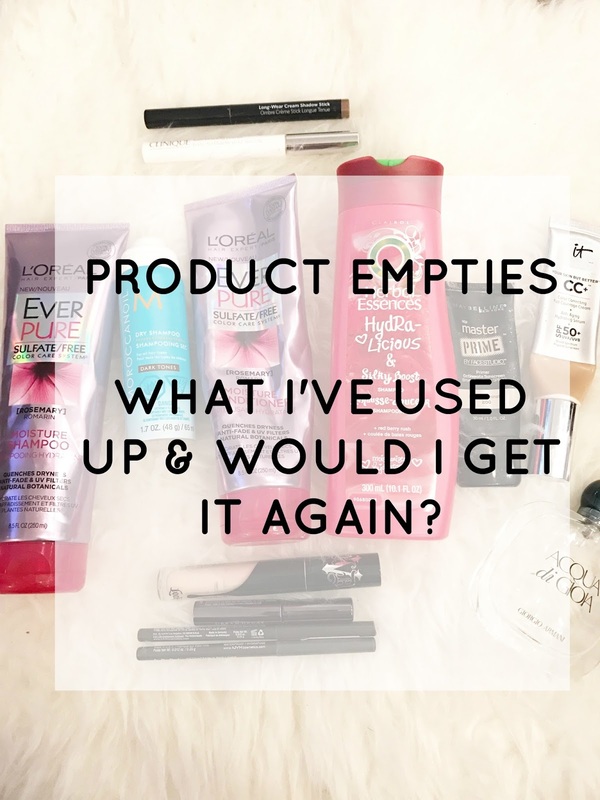 What are some of your recent empties? Would you like to see more videos on here? Any products that you recommend I try? I think I need to get on the bandwagon and try some of these products. Mainly the Bobbi Brown sticks and the Dry Shampoo. I love the way Moroccan oil products smell, so I can't wait to check that one out. You are the cutest and funny!!!! The ever pure line is one of my favorites and I cannot get enough of Moroccan oil stuff!! Keep these videos coming, great way to start my morn with sweet B!!! I've been using the Loreal eyelash primer and really like it. Why does mascara have to be so hard to find...too wet..dries out too quickly...blah,blah. Right now I've really been on the struggle bus trying to find the best remover for mascara so if you have one you love I'd love to know! Empties videos are always some of my favorites! Best CC cream hands down! That L'Oréal eye lash primer seems like something I need to get. And now I feel I need to buy some of those cheaper shampoos!! I usually never finish a product, I'm so guilty of that but the CC cream is coming to an end since I bought a sample and I'm buying the full size because it's the best! Love these posts girl. I'm with Amanda - I so often don't finish a product. I will say with my foundations, shampoo, and hairspray, I normally use it till the very end! I may have to try those shadow sticks! Such an awesome video lady! The Bobbi Brown Shadow Sticks are SO amazing! I used one of them on my wedding day actually! So many great products--I need to check out that dry shampoo because I'm a little dry shampoo obsessed lately! I love empties! How do you apply your CC cream? Do you use a brush or blender or just your fingers? I was thinking about purchasing it when my current one is gone. I need to try the NYX liner, I usually grab a Loreal one for drugstore brand. And I am totally with you on not loving overly wet mascaras. They just make a mess! Seriously loving this video so much and I always love hearing and reading about what people have for empty! Its like so fun to me! And seriously huge congrats on the first youtube video!!! I'll have to watch the video later today when I have more time to really sit and enjoy, otherwise, something's bound to distract me, haha! In regards to the thumbnails, you can take a photo related to your video and edit it on PicMonkey and then simply upload it to the video of your choice, once you've already uploaded the YouTube video. I know how much you love the Moroccan Oil dry shampoo and since I'm nearing the end of my Dove one, which has been okay, I think I may give this one a try; a few people have been raving about it, including yourself, so I'm so curious as to how it would work on my hair. Thanks for sharing, beauty, and I hope you're having a great week so far! IT's CC cream is seriously the best. I will have to try the Moroccan oil dry shampoo. A few years ago, I used their hairspray and just loved the scent. That's awesome the dry shampoo doesn't leave a ton of white residue. Thanks for sharing these, Biana! I love that CC Cream! It works so well. In fact, I'm wearing it today! I hope how dewy it makes my dry skin look. Oh I will have to try that moroccan oil dry shampoo, I had no idea they made one. thanks for sharing. The L'Oreal lash primer is the best! I haven't bought the Clinique version since that one came out. Definitely going to try that NYX eyeliner, too. Great job on your video! Would you believe I've never tried dry shampoo?? I really need to get on this train. This is a great review, thank you! I really wanted to try the IT CC cream because I had heard great things. I was shocked when I went to the store and saw how expensive it was - as much as my foundation which is the only non-drugstore thing I buy. LOL I think I am too cheap! Totally agree about the UD mascara! It's wet and clumpy!! Totally with you on the CC cream. You go girl for making a video!! I've been wanting to venture into this territory but I'm overwhelmed thinking about the amount of work to make one! ha. Since I have tiny eyelashes I'm going to need to try lash primer! i have heard amazing things about the Moroccan Oil dry shampoo, so i might have to give it a go one day. i just got the it cosmetics cc cream and i have to say, i love it as well! so simple and easy! Love the video, Biana!! I love everything Moroccan Oil so need the try that dry shampoo! I'm so intrigued by the eyelash primer. My poor lashes are struggling & need all the help they can. I love Herbal Essense shampoos. They smell so lovely! Yay for a YouTube video!! That's so awesome, girl! I've been wondering about eyelash primer. Mine aren't naturally very thick or long so I wonder if it would help me! Maybe I should try! The Moroccan Oil Dry Shampoo sounds amazing...do you know if they have it for blonde hair? I'm currently using the L'Oreal Ever Pure S&C and love that it's sulfate free. It leaves my hair feeling super silky and, as you said, it has a great price point for the quality. Woooh! Can't wait to watch this video later! Tons of goodies I see here that I know and love! You do great on the videos- I vote for more of them! ;) I am headed to Ulta today so I think I'm gonna try out that CC cream- thanks, girl! I need to start using eyelash primer! Such a cute video! I need to try out some of these products. Great post! Love this, good work chica! Adding the dry shampoo to my list of ones to try out for sure because I also have really dark hair. I love Aqua Di Gioia too! I swear that I probably have a perfume problem... But I like the idea of buying the roller ball of a scent so you don't have to really commit such a high dollar amount, or buying when Sephora is having their semi-annual sale! Love the video girl! Some of these products I haven't tried, but now I do! Great video! I love the nyx products and really need to check out more of the moroccan oil products too! I finally picked up the CC cream during the Sephora sale and am so excited to finally test it out. That perfume is one of my favorites too! I loved watching this & you should totally do more videos! I love these types of youtube videos! And you are so well spoken, you should do more! And I agree with you on the Moroccan oil dry shampoo... The best!! Empties posts are the best posts! So many good products I need to try!! I am really intrigued by the primer and Bobbi Brown shadow stick... the dusty mauve color sounds amazing. Loved the video - you should really do more of them! Great job! I am obsessed with the IT Cosmetics CC Cream. It's the best! Thanks for the reviews! I'll have to try the dry shampoo! Dear, you are so cute! I also want to try the shampoo! How exciting that you are doing videos! I've always thought about doing some but I feel like I would be camera shy heheh. Btw, I didn't know there was Morrocan Oil dry shampoo?!?! Gotta go pick that up! These are my favorite and you do a great video!!!! I love that Moroccan oil dry shampoo!! I also love their hair serum stuff that you put in wet hair after a shower. Loooove all Bobbi Brown products, I'm a tried and true fan!